﻿What makes Darlene Ebel happiest? Biking! Just ask her! Last year she spent eleven days with a tour group bicycling between Copenhagen, Denmark and Hamburg and Berlin, Germany! A local gal, Darlene grew up in Naperville on Royce Road, where her father worked in the near-by gravel pit. Later, with degrees in historic preservation and urban planning, she worked for many years at the University of Illinois, Chicago campus, as director of Office of Facility Planning and Space Management. Now retired, she and her sister Nancy often work together on philanthropy quilts, both with their church group and with their local cousins. And each September they travel with the cousins to North Carolina to participate in quilt camp with more quilt friends. She thinks of herself as a new quilter and is currently investigating more involved design work. She has always loved textiles and has been a tablecloth collector for many years, with a collection numbering hundreds. 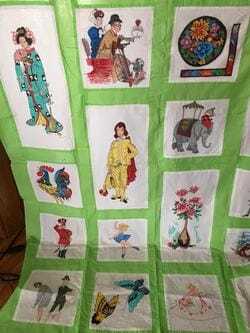 At times she has purchased antique quilts and blocks on E-Bay, with plans to complete those that are unfinished. Visiting the Ruby Short McKim website is one of her favorite things to do. Even though Ruby is long-gone, her family still circulates her newspaper patterns from the early to mid 20th century. 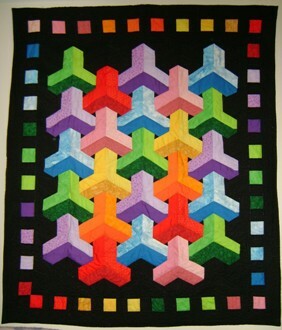 Dar also loves the quilt work of Marie Webster, and was blown away by the work of the Gee’s Bend quilters. 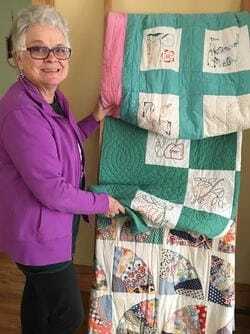 Now that she has begun to work on her own quilts, she believes she will enjoy free motion quilting, but is still afraid of cutting into the fabric for fear she’ll err, a feeling we can all relate to. She is eager to finish some of the antique quilt pieces she has purchased online and can see herself working toward becoming a more original quilter, designing her own patterns. She’d also like to learn to do hand applique and hand quilting to finish some of her E-Bay purchases in the style in which they were begun. After joining the guild early this year, Darlene jumped right into doing philanthropy quilts. She is also working with Sue Damitz and sister Nancy Ebel on Special Projects.